As spring has sprung, it’s time get outdoors and start a little landscaping here in Olathe, KS. There’s no better time than April, May, and early June to spruce up the grounds around your home. If you’re ready to upgrade your Olathe landscaping this year, you’ll need a few ideas. While you won’t need to be an expert green thumb, these tips are sure to help you avoid some mistakes. One of the favorite Olathe landscaping trends this year is adding a front yard fence. While certain homeowners’ associations won’t allow it, this small change can look stunning. With a variety of designs to choose from, you can add this bit of traditional landscaping styling to your home this spring. 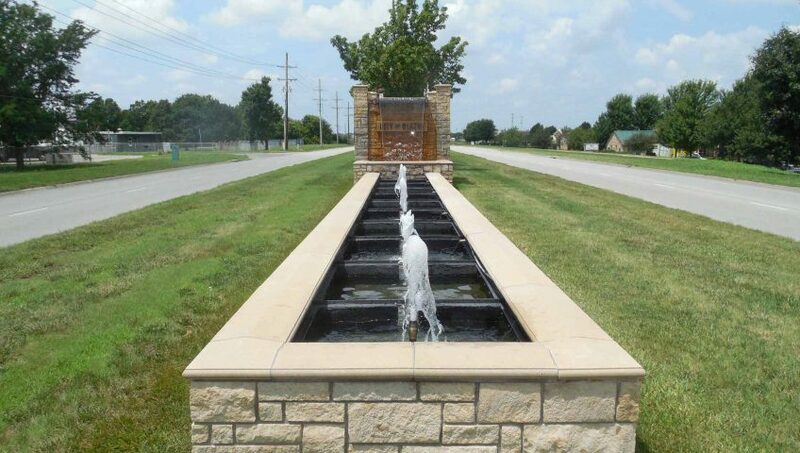 One of the easiest ways to add value to your Olathe landscape is through a water feature. You don’t need a full-fledged pond to make your water feature pop. Just adding a little waterfall or fountain can change your whole landscape. Many water features are self-contained these days and easy to manage. Why not add an innovative piece to your landscape that’s also useful? Olathe outdoor kitchens are very popular these days. You can add a full-fledged outdoor kitchen or just build some preparation space around your grill. Dogs and gardening don’t always go hand-in-hand. In fact, they rarely do. Still, you don’t want your furry friend digging up your garden. One easy way to keep your dog out of the garden is to build them a dog-friendly area, like a sandbox. Then bury treats, toys, and bones in the sand for your furry friend to dig up. One of the harder, but stunning ways to add value to your landscape is through an Olathe retaining wall installation. Retaining walls can change the whole look of your landscape. Make sure you keep a lot of flowers around your landscape this spring. One of our favorite ways to add flowers is to keep them by the front door. You should always have flowers to greet guests in the springtime. Adding plants and landscaping features around your driveway will give your home a professional, resort-style look to it that’s hard to compete with. You’ll be the talk of the town once your dress up your driveway with an array of flowers and plants. If anything on your property isn’t stunning, like a shed or outdoor workspace, consider hiding the space with an array of plants and flowers. A beautiful display of plants or flowers can turn an eyesore into a stunning sight quickly. You already know what consists of an Olathe landscaping by definition. Landscaping is making or maintaining improvements to a property’s grounds in practical or aesthetically pleasing ways. Anything and everything on your property that is not part of the home itself is part of the landscape. To break things down even further, anything you can see outside your window that is part of your property is also part of your home’s landscaping. As an Olathe landscaper, you know that your grounds can have numerous features. No two landscapes are the same. It’s impossible. No two lawns grow at quite the same speed. But there’s more to it than that. With such an array of different features, it should come as no surprise that every ground and landscape is completely different. While humans control nature to create a stunning landscape, nature can only be controlled so much. That’s the beauty of Olathe landscaping. With landscaping being such an individual endeavor, there’s no way to do it wrong. Your yard is who you are. Your Olathe landscape is a part of your personality. If you plan to live in a home forever, then you should only worry about your personal landscaping tastes. Get crazy with it. Do whatever you feel like. However, most of us live in homes that we will one-day list on the market. If that’s the position you’re in, then don’t forget to consider potential buyers and place curb appeal at the top of your list. While you may find that big tree in the middle of your landscape to be an eyesore, you don’t want to remove it. If you do, you’ll be hindering curb appeal and resale value significantly. Mature trees help sell houses. You should think twice before you ever cut one down on your property. As Olathe landscapers, we see it all too often. You take on a big project, like an Olathe retaining wall installation, only to realize that your skill set isn’t exactly there yet. Then we get a call asking for help. While we are certainly happy to oblige, we try to warn people of the perils of doing too much yourself. If you’re thrilled that spring has sprung and ready to get a grip on your Olathe landscaping, get in touch. Here at Huston Contracting, we’re here to help your lawn look its best. No matter what your landscaping needs are, we guarantee honest and dependable work.